One of the most significant problems that Christians and creationists encounter from atheists is that they seem to want us to accept their evolutionary materialistic naturalistic presuppositions, but they do not want to let us have our own presuppositions. Because we reject their views and believe God's Word and in miracles, we are often labeled "science deniers" or "reality deniers". The problem here is that they are denying logic itself by imperiously setting the definitions of "science" and "reality" in their favor. From there, they feel entitled to ridicule and misrepresent us. I don't rightly recollect anybody appointing atheists to be in charge of definitions. Although village atheists claim to believe in "reason" and "science", they frequently display little knowledge of or skill in either one. (For example, there is a narcissistic atheopath who used profanity in comments on my posts, and said he would apologize if I admitted he was right on other things. Aside from being blatantly irrational, he was also blackmailing me and telling me to lie that he was right so he would apologize for his bad behavior!) We have to deal with outright lying, prejudicial conjecture (offering an uninformed but strongly negative opinion), and other fallacies. Even more so for those of us in apologetics. Something we frequently encounter is the straw man fallacy. Basically, it's a misrepresentation of an opponent's position and then attacking that instead of the real position. Professing atheists do this frequently. 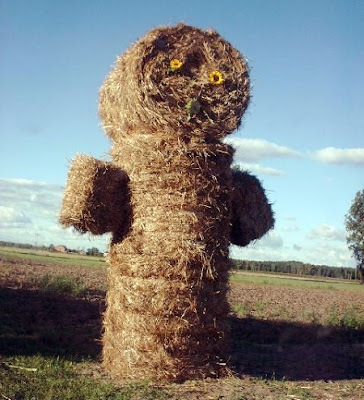 Making a straw man argument is easy to do, and people often do it by accident. It's no surprise to come into contact with atheists and evolutionists who misrepresent the Bible, Christians, creationists, and so on in a malicious way. They'll cherry-pick things out of the Bible that are taken out of contexts (not just the context of the surrounding verses, but historical, cultural, linguistic, and so on). Then when they have their bucket of picked cherries, they dry gulch Christians with items for us to defend. I'll allow that other times, someone gets a wrong notion and makes a challenge on something out of context, but is not being malicious. An atheist on YouTube posted a little-watched video (269 views at this writing) called, "A Challenge to Christians". He seems to want to be reasonable and hear our side of the story, but he has grabbed some things that are, again, out of context. (Interesting how people claim to come up with stumpers or even things that cannot be answered, but don't bother to do their homework; most of the answers are readily available online through various apologetics ministries.) The video begins with a vague misrepresentation of Matthew 10:33 to prod us into participating or we're denying Christ, but I can hazard a guess as to why he didn't actually use the context, even if only the whole paragraph in Matthew 10:26-33. It is indeed unfortunate that many Christians are slack jawed when confronted with the alleged stumpers that atheists throw our way. That's because too many professing Christians do not actually believe the entirety of the Bible, yet claim it's true enough to give them eternal salvation. My challenge to Christians (as I've stated many times before) is to know what and why you believe. Get into the Word and good biblical teaching, not that Rev. Dr. Feelgood-style nonsense. We are to be ready to give an answer (1 Peter 3:15). Those of us who are biblical creationists have many excellent resources available to not only build up our own faith, but to help equip us to give answers. Dr. James White took that atheist's "Challenge to Christians" and pointed out several flaws in the author's naturalistic presuppositions and reasoning. (He was under time and other constraints, so he could not go into as much detail as he'd like.) The video is embedded below, and the link to the audio is here. The first part of Dr. White's discussion about something else is also helpful, but the pertinent area begins at the 14 minute 14 second mark and ends at 34:12. I'd be much obliged if you'd see how the atheist's misrepresentations are answered. If you want to see it, the atheist's original video is here. For more about evidence, presuppositions, and logic, you may want to see my article, "Evidential or Presuppositional Apologetics?"